AnewDriver’s Success Stories 2016: We would like to thank everyone who chose to learn with us in 2016! Here are some of ANewDriver’s successful stories this year: Come and become part of another one in 2017! Book Now! 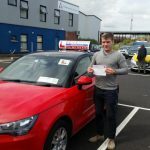 Congratulations to Alexandru Iacobescu who passed his test yesterday in Finglas with only 2 grade 2 faults. Alexandru completed his 12 EDT lessons with A New Driver and had no problem passing his driving test. 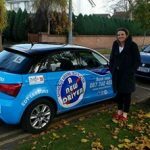 Congratulations to Emma Everan for passing her test in Finglas test centre. Congratulation to Ann Marie Lawlor for passing her driving test first time in Finglas. 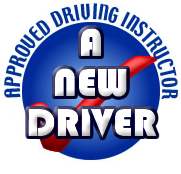 Ann Marie did a course of 10 lessons to brush up on her driving and passed the test with only a few faults. 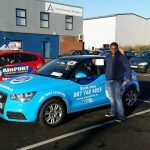 Congratulation to Visham Sumputh who passed his test in Finglas. Driving during Cold Weather – Taking a number of simple precautions can ensure safety on Irish roads during winter. Don’t get caught out if severe weather hits, make the necessary checks on your vehicle now. 1.Check your tyres…they are your only contact with the road. Tyres should be at least the minimum legal thread depth of 1.6mm but need to be changed before they get this worn. Tyres need to be to the correct tyre pressure to give the motorist the best chance in extreme conditions. As we come into the winter months, motorists are advised to use dipped head lights during the day so you are easily seen. Headlights and taillights should be in working order. Check your car manual and find out if your vehicle has safety assist technology such as Electronic Stability Control (ESC) or Anti – Lock Braking System (ABS). Learn how these technologies can assist your driving in harsh weather conditions. It takes longer to stop a car during the winter weather so slow down and allow extra distance between you and the car in front. 5. Make sure you can clearly see. All too often motorists do not de-fog or de-ice windows and mirrors which can compromise visibility. This winter ensure windows and mirrors are clear, and carry a de-icer and screen scraper. Do not use boiling water as this can crack the windscreen. Black Ice is one of winter’s biggest hazards as it is difficult to see. Watch out for sheltered/ shaded areas on roads, under trees and near high walls. 8. In the event of a breakdown. Drivers need to ensure their vehicle is well in off the road so as not to obstruct other vehicles. The driver should also put on their hazard warning lights. If the vehicle breaks down on the motorway pull in as far as you can, alerting traffic behind you with hazard lights. The driver should leave their vehicle, get behind the barrier (on the embankment) and call the Gardaí, on their mobile phone or roadside telephone. 9. Keep up to date. Listen to local weather and traffic reports. Pay heed to the weather warnings alerting drivers of unsafe and dangerous driving conditions. 10. Check out the RSA’s publication ‘Severe Weather Advice for Road Users’ for more detailed advice on what to do if severe weather strikes. Here are some Questions and Answers that are commonly asked on your Driving Test. Click on the Question and find out the Answer. What shape and colour is a warning sign? What should always be kept clean on your vehicle? Lights – Reflectors – Windows – Mirrors – Registration plate. Driving into hailstorms can be very dangerous. Hailstorms can start very quickly without giving any warnings. Keep an eye on the weather. While it is difficult to accurately predict a hailstorm, they are most commonly associated with severe weather such as tornadoes and thunderstorms. Check your local newspaper or weather channel for the daily forecast, and plan your schedules accordingly in the event of severe weather. Stay inside the vehicle. 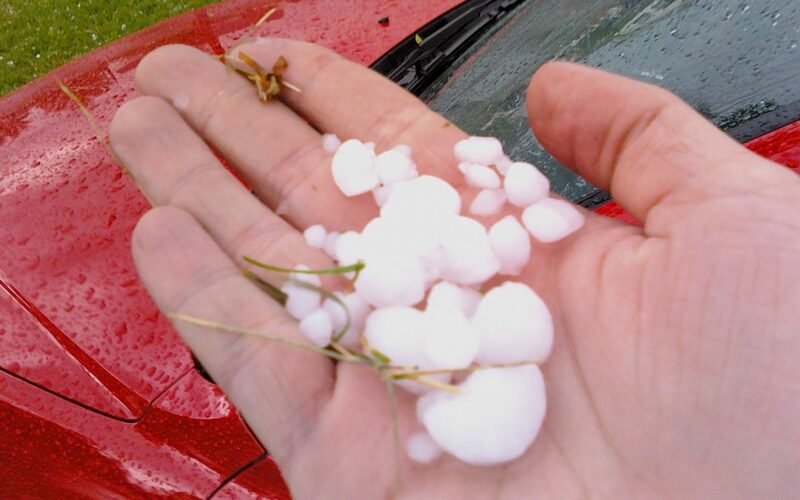 Hail falls at fast speeds, and it can cause injury to those in its path. Stop driving and pull to a safe place so hail doesn’t break the windshield or any windows — driving compounds hail’s impact with your car. Stop under an overpass, and don’t forget to pull out of traffic lanes and onto a shoulder. Avoid ditches due to possible high-rising water. Motorists should pull off to the side of the road, away from trees or other areas where debris could fall, and stay undercover until the storm has passed. Keep your car angled so the hail is hitting the front of your car. 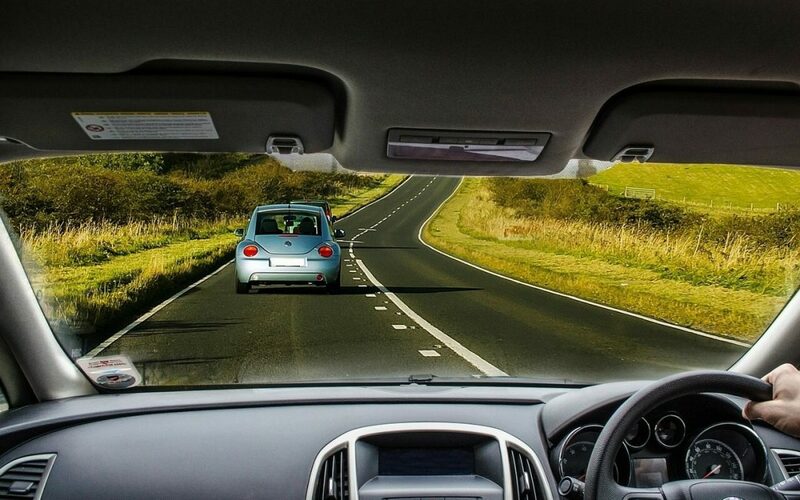 Windshields are reinforced to withstand forward driving and pelting objects. Side windows and backglass are not, so they’re much more susceptible to breakage. Lie down, if possible, and keep your back to the windows. If you have a blanket, cover yourself with it to prevent possible debris from hitting you. Always wear your seat belt – and make sure all passengers buckle up, too. Don’t try to fit more people in the car than you have seat belts for them to use. Adjust your car’s head rest to a height behind your head – not your neck – to minimize whiplash in case you’re in an accident. Make sure your windshield is clean. At sunrise and sunset, light reflecting off your dirty windshield can momentarily blind you from seeing what’s going on. Experts now recommend that you hold the steering wheel at either 3 and 9 o’clock on the wheel, or even lower at 4 and 8 o’clock. If you’re in an accident and the airbags go off, you’ll be safer with your hands not flying into your face from the impact of the airbags. Don’t make assumptions about what other drivers are going to do. The only thing you can assume about another driver with a turn signal on is that they have a turn signal on. He/she might not be turning at all, and just forgot to turn it off. Watch out for aggressive drivers, and try to stay out of their way. They are the cause of a lot of accidents – especially on freeways. Never pull out in front of anyone or swerve into someone else’s lane. Make sure your car always has gas in it – don’t ride around with the gauge on empty. If you’re in the country, watch out for animals. 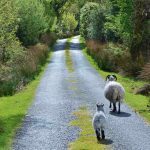 If you see an animal approaching, slow down and flash your lights repeatedly. Dusk and dawn are particularly bad times for running into animals, so be on the lookout for them. Don’t park in fire lanes around the school. Not only will you probably get a ticket, but you could be blocking the area where a fire truck might need to park. 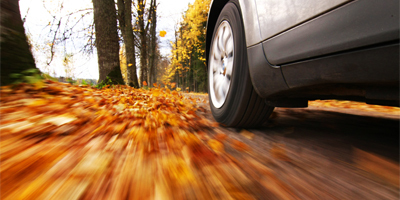 Every season presents its own challenges on the roads, but autumn is one season that often gets overlooked. With weather conditions that are typically not as harsh as those in Winter, Spring, and Summer, it’s easy to take it for granted. While the weather may not be too harsh, it’s more unpredictable than other seasons, so we should be aware of some hazards. Any morning may be warm, cold, foggy, raining, sleeting, or even snowing. This season also sees the first frost, which can cause roads to be slippery, especially on secondary roads where ice can form and take longer to dissolve. In addition to weather conditions, fallen leaves can also cause slippery conditions: that’s because they contain a large amount of water and are in decomposition process. So the best action to take when spotting a road covered in leaves is to slow down where there are large patches. Driving from a wheelchair: the new Hi-Tech vehicle is a boost for drivers with physical disabilities. 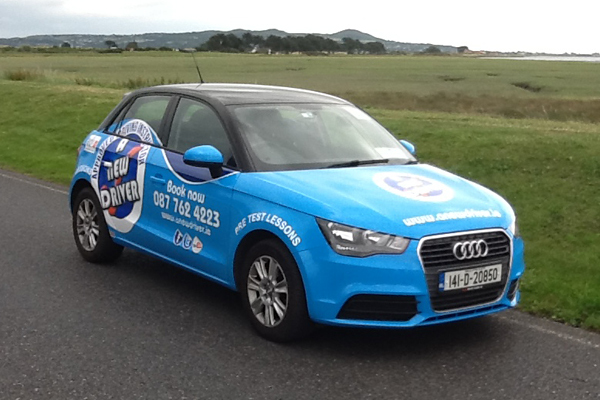 The Irish Wheelchair Association (IWA) will officially roll out the new motor and driving tuition service. It will be known as a the ‘Drive from Wheelchair Tuition Vehicle’. 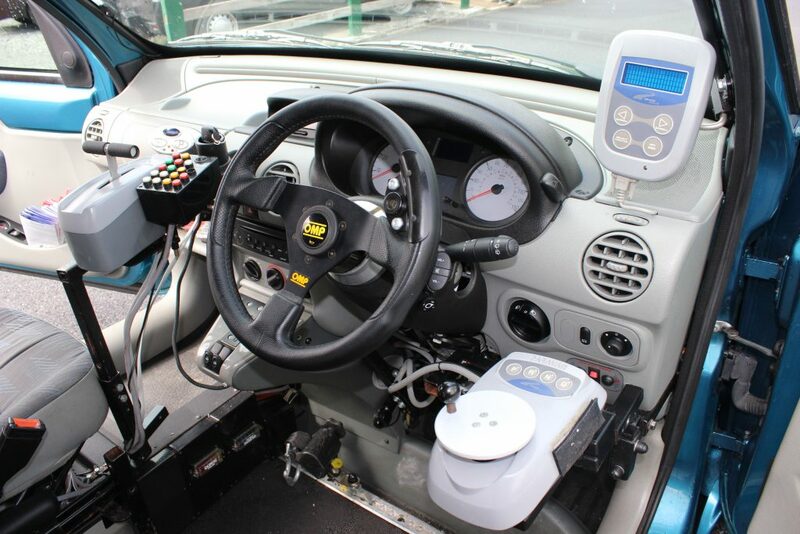 The important addition to the IWA’s driving school fleet means people will be able to learn to drive from their wheelchair, alongside a driving instructor. While Hi-tech advances are usually associated with new and eye-catching cars, it is good, for once, to highlight its use in a manner that can improve people’s lives in such a profound way. The new vehicle is expected to help open up opportunities for many with physical disabilities. 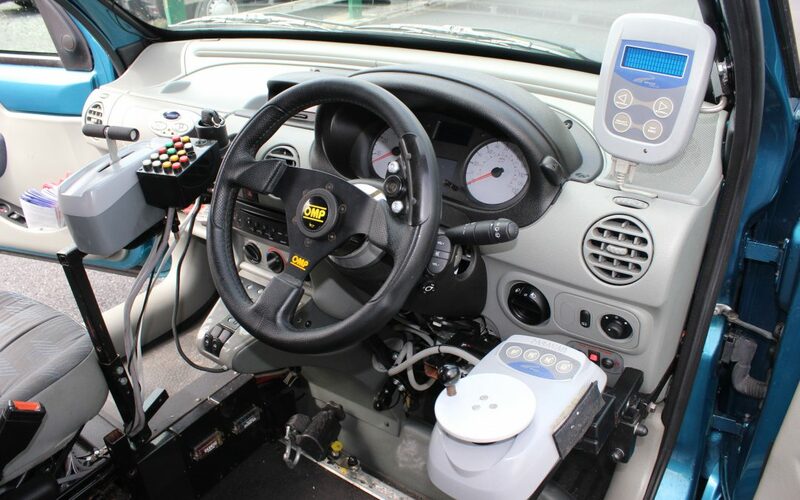 Those who use a power or electric wheelchair will be able to learn to drive in the specially adapted vehicle which, as our pictures show, has a spread of controls and technology designed to help them. The vehicle is expected to benefit many as it is capable of substantially increasing their level of independence on a day-to-day basis. As a result, it is anticipated that it will help improve opportunities for employment and/or further education. Driving with sun glare? Sunlight can cause major problems seeing when you drive at any time of year, not just in summer. The period just after the sun rises and just before it sets are dangerous times for drivers, whether the days are long or short. 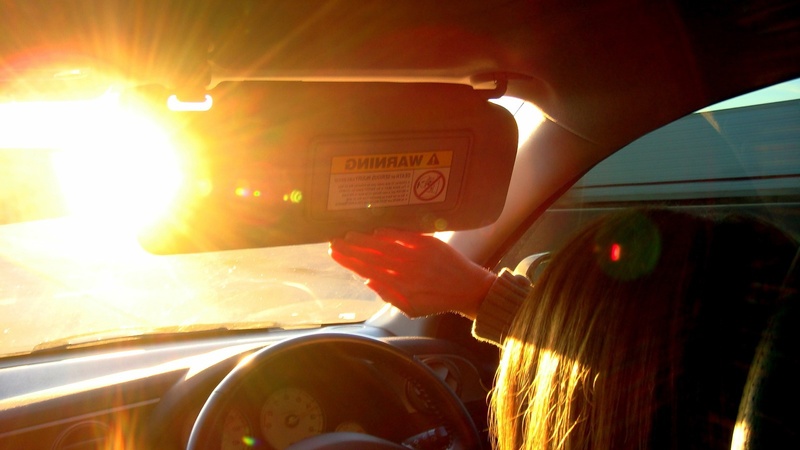 In Ireland, RSA & Gardai have been warning drivers of ‘sun glare’ as it has been linked to many road deaths. 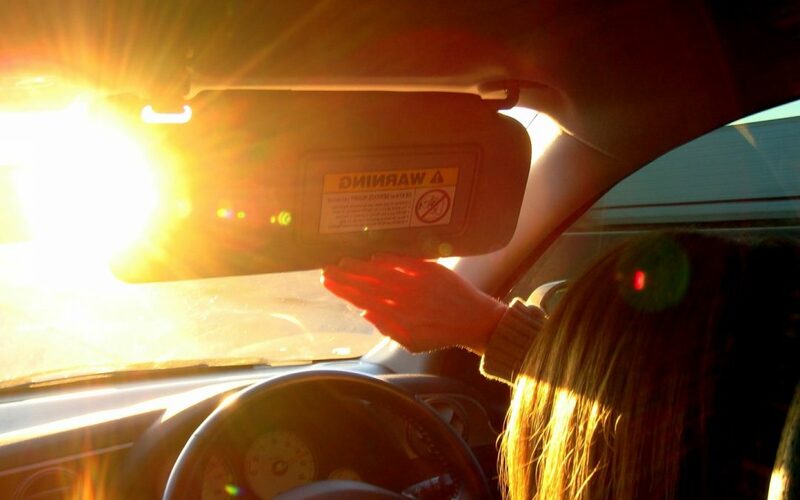 When the sun is shining into your eyes as you drive, you don’t have a good view of the road due to glare. It can be impossible to get a true view of the road ahead. But you can take steps to improve your vision when the sun is out. Wear a pair of good Sunglasses – Summer or winter, you must wear them. A good pair of polarized sunglasses are an essential safety tool for any driver year round. They won’t give you perfect vision in the glare of the sun, but they are your best first step. Make sure your windscreen is clean before driving – Grime on the inside and outside of your windshield makes the sunlight refract and scatter, which intensifies the glare. Clean glass is easier to see out of whatever the weather conditions, but especially when you are facing sunlight. It is best to clean your windshield before your trip. Using your car’s windshield cleaning device during the drive leaves drops of washer fluid on it, which reflect the sun, making it harder to drive until they dry up. Avoid clutter on your dashboard – Sunlight reflects off items on your dashboard. Anything with a shiny surface, including paper, can add to your trouble seeing well. Store items in the glove compartment or buy a caddy to hold them. Leave ample space between you and the driver ahead – Give yourself plenty of room out in traffic. If there is a problem, this extra room can save you from running into the car ahead. Try to avoid times when glare is at its worst – It is not possible to avoid it at all times, but it can be helpful to leave even 30 minutes earlier or later for your commute to avoid the problems with glare. If you can’t, then add extra time to your trip. Rushing when driving with the sun glaring in your eyes is asking for trouble.